In my quest to furnish the new house, I've been traveling around the internet. One thought was that I need an orange chair for living room or the parlor. At the moment, one of those rooms is completely empty except for two tool boxes, a rolled-up rug pad, and a TV cabinet we need to sell on Craigslist. Places for people to perch might be nice! How about orange? Here are some options I'm eyeing. Some are just for pretend because the price tags are bananas. For my budget, anyhow. I honestly like the two cheapest ones best! They're too pricey for me right now, but I'm on the lookout for more affordable similar ones! So obsessed with that leather one! It would look so amazing with some bright blue accessories!! I'm really drawn to the Parlour Atomic chair, and also the Regan chair. I'm think I'm going to bookmark that Regan chair for my own living room. Great styles, all of them. Laura, I didn't know Poppin sold chairs. Interesting! Clyo, nice work on that slipcover! Anonymous, thanks. Never been to that site before. Ha! 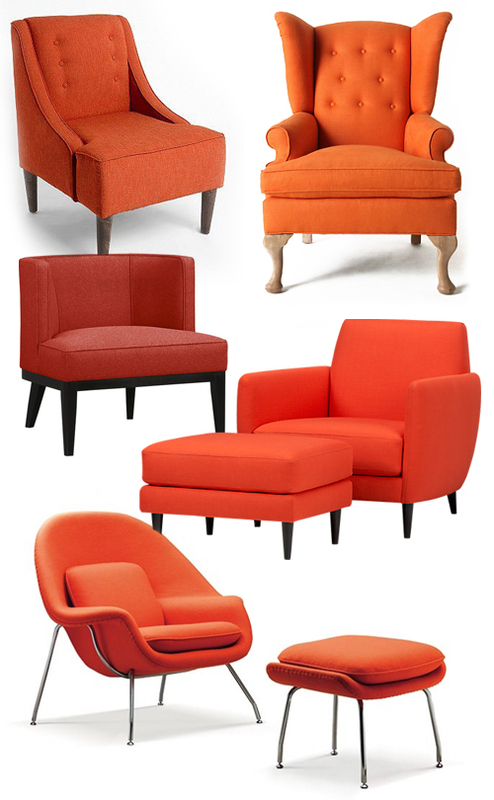 This morning I also posted an orange chair roundup (IKEA only). Orange-loving minds must think alike. You've included many of my favorites here. We settled on (and love) West Elm's Victor in "campfire" linen weave. Urban Outfitter's chairs were tempting too. Oh my god! I didn't know Poppin! Do they send to UK? I'm just like crazy with all these pink stuff. BTW, I'm afraid I love the expensive ones. It seems even "orangier" to me. In paticular the Howell Wingback and the Womb chair. Oposite styles but so cool. Tough to choose just one from that bunch even after eliminating the out of budget ones. But enjoy the search! would look great against that blue! I love those colors! My husband would die if I had anything in a floral print, though. He lets me do anything I want, pretty much, with one rule: no flowers. Beautiful colors and designs! I think I like the Howell Wingback the best - the walker finish is striking. My fave is the Regan chair - simple and stunning. Oh my goodness, I want all of these in my house! I like the wing chairs best. I love orange furniture! About 15 years ago, I bought two chairs at the church garage sale: one of them was the exact same lines as the top left chair in your first images, but upholstered in an aqua and pistachio brocade; the other was the exact same lines and color as the top left chair in your second grouping, but with different legs. And I got both of them for $5. Total. Sold or gave them away several years later. Jana, that's so funny! Wow, $5! Good deal. They call it rust, but it's definitely orange. It also has a matching footstool! (sold separately, but worth it) It's super comfy, my husband loves sitting it in to watch tv. Oooo, thanks for sharing! 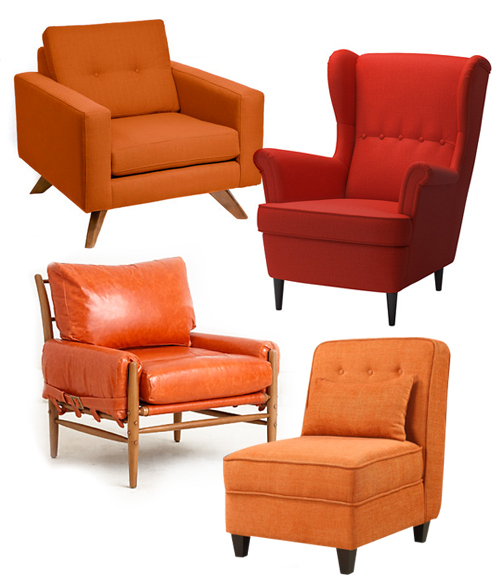 It's so helpful to hear from people who actually OWN orange chairs and can make recommendations!